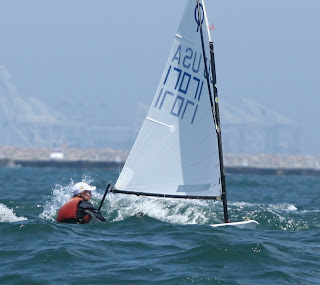 LISOT has a very strong showing at this years' USODA Nationals in San Pedro, California. 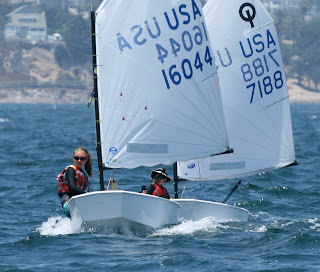 In one of the best regattas of the year for wind, surf and sun, 7 LISOT sailors placed in the top 25 after a long 4 day series that saw 13 races for the Gold/Silver fleet and 12 races for the Bronze/Pearl Fleet. LISOT was lead by Drew in 8th, Maeve 10th, Holly 13th, Harry 15th, Reinier 18th, Megan 21st and Lily 22nd. LISOT girls also dominated - the top 4 were Maeve, Holly, Megan and Lily. Cabrillo Beach YC ran a terrific event which saw slighly lighter than normal conditions for the first 3 days (12-15 knots) and more typical "hurricane Gulch" winds on the final day with steady breeze over 20 knots and a stiff chop on top of a long ocean swell. 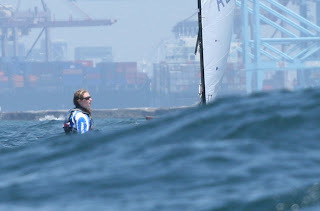 It was common to loose sight of a sailor behind a big wave or swell. LISOT coaches Trevor Moore (just back from the 49er Worlds in Garda) and Fran Bellocchio did a great job keeping our sailors focused and in shape for the physically demanding event. - such as Holly, Harry and Megan. Congratulations to all for an outstanding regatta.